TEDxYouth@Tallinn 2016 “Step into the Future” is happening for the 5th time! We offer a full day of talks, activities and discussions for youth. Our audience is mostly high school students but we have no age limits and through the years our attendees’ age has been in the range of 7 to 66 years. So, we invite all young and youthful people who are interested in problems facing our youth today and things that move them. The speakers are from Estonia and abroad, topics range from music to science. Between the talk sessions there are breakout sessions with several interesting activities, some of them about science or tech, some about discovering yourself. We hope that part of the breakout sessions will be filled with lively discussions between attendees and speakers about the talk topics. All the activities, lunch and coffee breaks are included in the ticket price. Our organizing team consists of volunteer enthusiasts, mainly high school students. 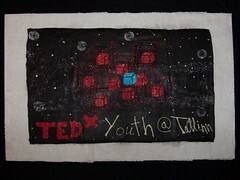 TEDxYouth@Tallinn wouldn’t be a reality without good supporters.